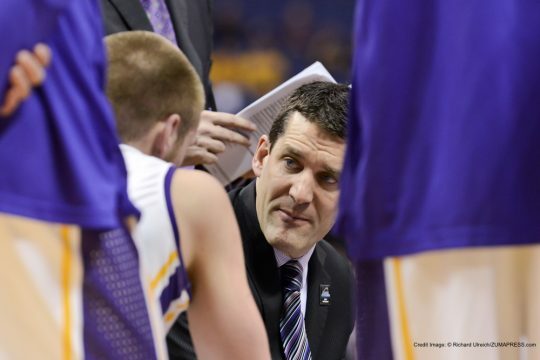 Wes Kosel is an assistant coach for men’s basketball under Head Coach Tom Billeter at Augustana University in Sioux Falls, South Dakota. Kosel joined the staff at Augustana after serving two seasons as an assistant coach at Colorado College and before that spent time at Texas Lutheran University and Haskell Indian Nations University. Kosel has an undergraduate degree in Exercise Science from the University of Kansas and a Master’s degree in Physical Education from the University of Houston. He has coached summer AAU programs, volunteered with elementary and middle school basketball teams, and has worked basketball camps for various programs including the Houston Rockets, USA Basketball, University of Colorado, University of New Mexico, Air Force, University of Houston, Texas State, and Texas A&M Corpus Christi. He also founded his own coaching website, HoopsChalkTalk.com, where he shares plays, drills, and coaching notes.